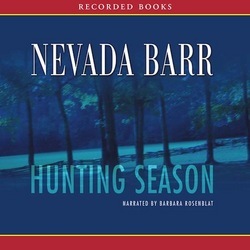 Earlier this year I listened to Barbara Rosenblat narrate a later book of Nevada Barr’s for the Global Reading Challenge. I enjoyed that one a lot so when I noticed this title on sale at Audible I couldn’t resist. National Park Ranger Anna Pigeon is called to a historic plantation house situated within the Natchez Trace Parkway in Mississippi. The near-naked body of a man has been discovered in the house and at first sight it would appear that Doyce Barnett might have been indulging in some peculiar sexual exploits. Barnett’s brother Raymond however is the town’s undertaker and candidate for Sheriff and as well as involving himself unnecessarily in the investigation he puts pressure on to ensure the more salacious details of his brother’s death do not become public. However it soon becomes evident that there is much more to worry about than Doyce’s presumed proclivities and Anna has to fight for her life more than once. Barr does a brilliant job creating her settings, this time the deep South of America which I have not visited in real life but now feel like I might recognise were I to travel there. Her descriptions of the park’s landscape as the season moves from autumn to winter and the broader depiction of the people and their shared history combine to provide a superb sense of what is a completely foreign place to me. But Hunting Season offers more than an exotic location. The plot is well-constructed and genuinely suspenseful and draws in several themes of interest beyond the whodunnit element of the story. For example through the eyes of one of Pigeon’s two staff, a black man called Barth Dinkins, we see how the impact of the area’s past, specifically its slave ownership and racism, is still felt today. I admire Barr for cleverly weaving this into her story rather than inserting some kind of message as a politically correct battering ram. Dinkins’ efforts to uncover the histories of those buried at a local slave cemetery and even his relationship with Pigeon which is awkward due to all their differences offer a really compelling thread within the story. There are other equally engaging storylines including Anna’s ongoing battle with the entrenched misogyny displayed by a section of the male population, not least of which is her other staff member, Randy Thigpen. The depiction of a strong, capable woman like Anna still being in peril purely because she is a woman is done in such a way that I’m sure most female readers would do as I did and recall some situation in their own lives that had similar overtones. I was almost surprised when the mystery itself was solved as I was completely engrossed in the lives that Barr has depicted here. As already mentioned Anna is a terrific character of the sort that should be shared with young women everywhere. She is imperfect but interesting because of that and does have a feminine side, though not the fondness for high heels that women are thought to have as a birthright. Here she is developing a relationship with Paul Davidson a Sheriff from another part of the State who also happens to be a priest which offers yet another angle of interest as Anna is an avowed atheist. The other people in the story are well drawn too, whether they are characters taking centre stage like her two rangers or have a relatively minor role to play like the woman who discovers Doyce’s body. Barr creates real people not mere two-dimensional fictions. My minor quibbles with the book revolve around my never-ending confusion with the various layers of legal jurisdiction that are depicted in American crime fiction (I’ve still no idea which branch of which service overrides the other in this book) and a slight disappointment over the-Anna-in-peril scenario towards the end (though it’s not nearly as bad as many other books). Overall though this is a first-rate novel with lots of bonuses on top of the very well crafted mystery. It’s no surprise that Barbara Rosenblat has won many accolades (including 6 Audie Awards) for her narration. Her use of accents, tone and inflection to provide a the wide range of characterisations demanded by this novel is superb. So far she has not recorded the latest book in this series but when she does (fingers crossed) it will be an automatic buy for me. Bernadette – Thanks, as ever, for the fine review. Like you, I admire authors whose descriptions of places really make me feel as though I’m there. Tony Hillerman and Martin Edwards do that for me, too, along with others. Glad you enjoyed this one! Oh, and I had to chuckle at your comment about the woman-in-peril plot line. I’ve seen that far, far too often, and I’m glad that this time, the book doesn’t suffer too, too much from it. Bernadette, I read this a while ago because we had driven along part of the Natchez Trace Parkway. I think this one had a scene where Anna gets out of her car to move a log, and it turns out to be an alligator. I’m currently listening to Endangered Species, and Barbara Rosenblat is wonderful. I’m also enjoying the mystery and the characters. This is my first Anna Pigeon mystery, but I’m pretty sure it won’t be my last. I’ve read nearly all of Nevada Barr’s books featuring Anna Pigeon, starting with “The Track of the Cat,” which takes place in Texas. I’ve enjoyed all of them, especially Barr’s genius at describing the environment in the region of the park Pigeon is working at, her unique ability to make a reader feel the location’s uniqueness, and, of course, Pigeon’s feisty and courageous personality. I have learned a lot about the flora and fauna of many regions of the U.S., while reading a terrific story. This one was one of the best, as I recall, as it also dealt with sexism and racism in the South.